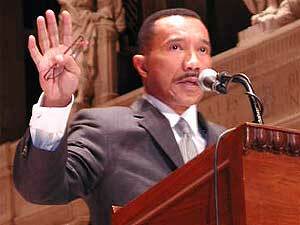 Civil rights leader Kweisi Mfume spoke Thursday night at the Basilica of St. Mary in Minneapolis. On the eve of the Martin Luther King Jr. holiday, the national president of the NAACP brought a message of celebration and a call to action -- challenging people of all races and backgrounds to "be more and do more." Minneapolis, Minn. — Kweisi Mfume has been leading the NAACP as its president and CEO since 1996. He was born and raised in Baltimore, Maryland. As a respected civil rights advocate, Mfume has received eight honorary doctorate degrees. He's also been a civic leader, as a Baltimore city councilman, and later as a Democrat in Congress, representing Maryland's 7th District for 10 years, before joining the NAACP. A diverse crowd of about 2,500 people came to hear him speak. He began with a reminder that the King holiday is not just about celebration, but about the challenge to speak out. "Dr. King would be appalled if he thought that there was no-one speaking out on this day or any other day, against all the injustices that still exist around us." Mfume spoke of enduring racism, and the growing gap between the "haves and have-nots" -- those who struggle with low wage jobs, homelessness and addiction. He urged people to challenge the status quo. "Celebrating Dr. King also means challenging ourselves and the rest of the country to do more and to be more. On issue after issue, we must raise the larger question." Mfume touched on several issues. He called on the U.S. House and Senate to pass hate crime legislation, and to enforce existing laws that prevent discrimination. Tying in election politics, Mfume urged African-Americans to reject political pandering from both parties. He urged people to judge politicians -- President George W. Bush in particular -- on what they do, and not just on what they say. "I find it particularly peculiar, as I left Atlanta and George Bush was arriving -- arriving to lay a wreath on the grave of Dr. Martin Luther King -- when a year ago, to commemorate his birthday, it was the same president that announced that he would do everything in his power to end affirmative action." Celebrating Dr. King also means challenging ourselves and the rest of the country to do more and to be more. On issue after issue, we must raise the larger question. Last year the Bush administration threw its support behind an unsuccessful Supreme court case seeking to overturn affirmative action laws. Mfume praised the Court for upholding affirmative action. "The recent Supreme Court decision on affirmative action in education underscores one simple fact, and that is that the education of our young men and of our young women is still of paramount importance to a majority of the Supreme Court justices, Clarence Thomas notwithstanding." Mfume says the NAACP and others are preparing lawsuits against every college that refuses to abide by the existing affirmative action laws. Mfume continued his criticism of President Bush, saying in his three years in office, he has not met with any black civil rights leaders in the U.S. It's a claim that, whether in truth or perception, resonated with many of those who attended. Taharqa Rhodes, 24, of Minneapolis, is studying to be a teacher at the Minneapolis Community and Technical College. He found Mfume's speech inspirational. "This is the only generation where there hasn't been any civil rights activists. Nobody in my generation -- the 20-somethings, the 30-year-olds -- is out there really fighting for civil rights," says Rhodes. "Here I am in school, and I'm looking at things as far as my future and whatnot, and I want to take a step towards making some sort of change. That's one of the reasons why I want to be a teacher." Mfume ended his speech with a reminder to vote in the upcoming election. He said there's no greater imperative than the need to protect the right of all Americans to cast a free vote, with every expectation that their vote will be counted. On election day, he said, we all get a chance to be equal.